R&D Tax Credits were originally created as an incentive to encourage UK companies to invest in innovation for the future. And, post-Brexit, it is more important than ever that eligible businesses claim for research and development funding in order to get the financial rewards they deserve. R&D Tax Credits were introduced almost 19 years ago, yet according to recent statistics, less than 10% of SME’s with a legitimate claim have actually applied. Why is this? These are just some of the incorrect assumptions people have regarding the R&D Tax Credit scheme and most likely explains why British businesses spend far less on research and development than other well-developed countries. 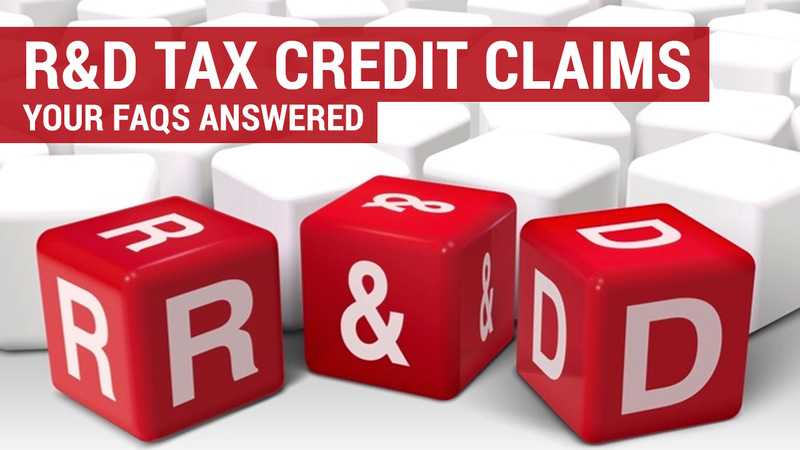 Below we’ll talk you through the most frequently asked questions on R&D Tax Credits, dispelling any myths along the way. Quite often companies can be put off by the lengthy guidelines and complex definitions set out by HMRC for R&D Tax Credit relief, and automatically conclude that their projects would not qualify. But you do not need to be developing space tourism or trying to find a cure for cancer to be eligible. As long as you are a Limited Company working towards overcoming industrial, scientific or technological uncertainties and develop new products, processes, software or services to address and overcome those uncertainties, then you could be eligible to receive R&D Tax Credits. R&D Tax Credits were set up to allow any Limited Company (regardless of size or profitability) the opportunity to offset any ‘eligible’ expenses spent on research and development; providing them with either a cash payment, a reduction in corporation tax or increased losses to be offset against profits in the future. There are two schemes available to companies when looking to claim R&D Tax Credit relief. SME’s (less than 500 employees). In this scheme, companies can offset against tax up to 230% of spend on R&D. If the company is making a loss, then this benefit can be used to claim a cash refund which equates to around 33% of R&D spend. Large Company (500+ staff or a turnover of more than £100 million). Larger companies can apply for a Research and Development Enhanced Credit otherwise known as RDEC. This allows for a tax credit of 11% of qualifying R&D spend. R&D Tax Credit has the reputation of being difficult to claim, with many businesses finding the process time consuming and complex. If you do want to claim then you will be required to have an in-depth knowledge of your industry and the technology used, as well as a good comprehension of HMRC’s R&D Tax Credit legislation. As this is often the stumbling block for businesses making a claim, we strongly advise that you employ an expert to guide you through the process. You will need to submit a technical justification report, which outlines what your business is doing in terms of research and development and the costs associated with it. This can be done as part of your Company Tax Return form (CT600), as a backdated claim (up to 2 business financial years post R&D activity) or as part of your business’ accounts if your company is of a going concern. What costs qualify for R&D Tax Credit Relief? There are a number of direct and external costs that you are eligible to claim for as part of an R&D project. These include staff salaries, subcontractors (at a reduced rate), utilities, software, clinical trials, prototyping and independent research costs. Capital expenditure does not qualify under the R&D Tax Credit scheme (although there are separate reliefs available), nor does expenditure on the production and distribution of goods and services, cost of land or payments submitted for patents and trademarks. How long does it take to receive R&D Tax Credits? The sooner you file a claim, the sooner you will receive your tax back from HMRC. Typically, a straightforward SME claim can be settled in as little as 28 days, however this does vary depending on the complexity of the project and the accounts involved. The payment itself will be placed directly into your bank account by HMRC if the cash refund route is chosen, or it is credited as a reduction to current or future tax bills if the company chooses this option. How far back can you claim R&D Tax Credits? You can make a retrospective claim for R&D projects, up to 2 years from your current financial year end. This allows companies who may not have heard of the R&D Tax Credit scheme before, to claim for previous projects rather than missing out on some much-needed money. It is hoped that Brexit will have a positive effect on the number of companies seeking to claim R&D Tax Credit, rather than a negative, but the economic landscape from April 2019 is still relatively unknown. As the UK strives to remain competitive in what may become a more isolated trading arena, innovation will be increasingly important as a cornerstone of the UK’s economy – especially if we want to continue to shine and standout on the international stage. At Approved Accounting we want to support more businesses invest in their future by making sure they receive the financial funding they are entitled too. To find out more, please contact us for R&D Tax Credit advice.